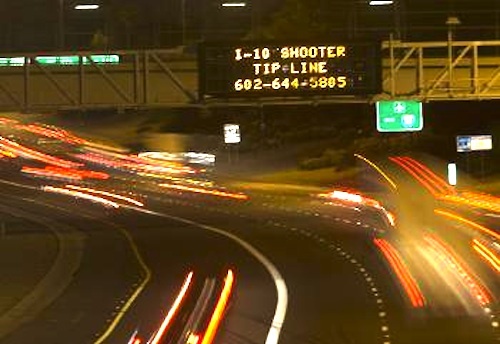 After Friday’s dramatic incident where a swarm of police surrounded and detained a man (who was with his mother) at a Phoenix area convenience store parking lot, Arizona officials have since confirmed that Oscar de La Torre Munoz is not the prime suspect in the string of 1-10 freeway shootings. “He is not our prime suspect, never was our prime suspect,” said DPS Public Information Officer, Bart Graves in a public statement. While Graves declined to answer what led authorities to orchestrate such an aggressive pursuit of Munoz, he said that investigators have been questioning the 19-year-old "about a lot of issues" in addition to the freeway shootings. Munoz appeared truly shaken Friday as he talked to reporters from the back of a police car and gave his account of how they all came at him, guns drawn and threw him to the ground aggravating a back injury. Although Munoz’s name has been somewhat cleared in relation to the shootings, after he was questioned on Friday he was arrested on suspicion of possession of marijuana and held without bond due to a warrant he had for a probation violation. A month ago Munoz had pled guilty to an endangerment charge following a previous arrest in May for alleged street racing. But the weekend drama didn’t end there. As officials continued their hunt for the person or persons responsible for the 1-10 shootings that have kept area motorists under siege for the last few weeks, even more incidents were reported on Saturday. One of those incidents involved a couple whose car window was shattered while driving just east of Phoenix and they managed to get the license plate number of a vehicle that had pulled up beside them before the incident occurred. 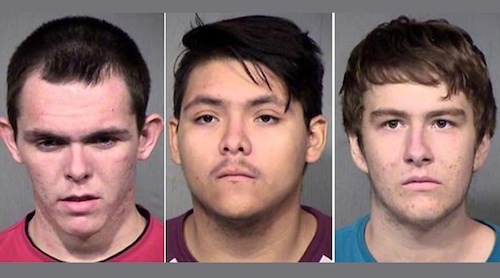 Authorities located the vehicle and arrested three teenagers who admitted to shooting at vehicles and pedestrians with a slingshot. 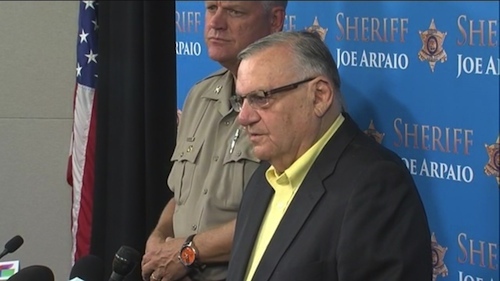 Maricopa County Sheriff Joe Arpaio confirmed that the three 18-years olds, Aaron Nottingham, Albert German and Christian Cook, were booked on charges of assault, endangerment and criminal damage. DPS Director Frank Milstead also made a public statement confirming that while the teens are facing serious charges, they are “copycat” criminals and there was nothing linking them to the 11 shooting incidents still being investigated. “This investigation continues as we work to identify and assist in the prosecution of anyone involved in these series of shootings. We need the ongoing support, vigilance and patience of our community and the media as this is a very complex and ongoing investigation,” said Milstead. There is still a $20,000 reward being offered for information leading to the arrest of the real suspected serial shooter. The tip line is 602-644-5805. If this becomes a trend then you can expect tints to be illegal nationwide very soon.